WASN has worked in Chirumanzu District since the late 90s and has formed support groups that engage in dialogue with service providers on issues of Access to Accelerated Prevention, Treatment, Care and Support, provision of free Mobile Clinic services that serve as a One Stop Shop. 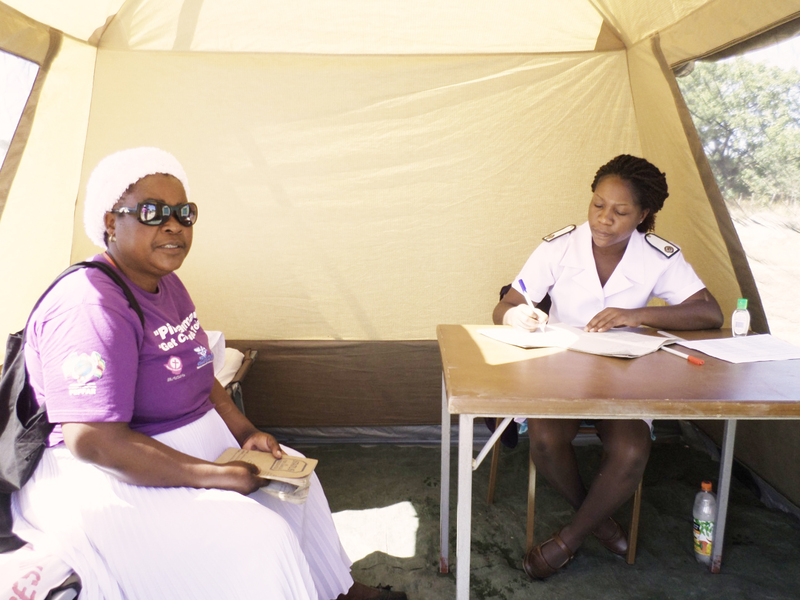 A community nurse attending to a patient at mobile clinic. WASN maintains that the impact of HIV and AIDS on women and girls is threefold, as they are the infected, the caregivers and the mothers of infected babies. Zimbabwe has over the past few years seen a steady decline in HIV and AIDS prevalence from 20.1 % in 2001 to 15.3% in 2007 and 13.7% in 2009. The reductions can be attributed to behaviour change initiatives across the country. But it is worrying to note that there is now a reappearance of sexually transmitted illnesses. WASN effectively complements efforts of the Ministry of Health and Child Welfare towards achieving the Millennium Development Goals via its mobile clinic for women in Chirumanzu. The clinic provides training and support regarding legislation that protects women from domestic and gender-based violence, access to treatment for STIs and other illnesses, as well as information regarding prevention of STIs and unwanted pregnancies, maternal health care, and other relevant topics. WASN works with the local hospital to provide health personnel (doctors, nurses, trained counsellors) and storage of drugs. The Community Relations Liaison officer from the local police will popularize the Domestic Violence Act together with the local leadership both political and traditional leadership. The positive effects of the mobile clinic is long-lasting as women will share their new knowledge within their communities, relationships between local women, local police, and local health services will be strengthened. The Mobile Clinic outreach programme has seen WASN identify families that are in dire need of assistance like a young family of Nicholas Nyika and his wife Ellah Mhlanga blessed with two sets of twins and all boys. Both parents are not working areÂ and are almost destitute. It is with this in mind that WASN pleaded for humanitarian aid in the form of food to alleviate the familyâ€™s problems. Before the coming in of the mobile clinic services, one of the children was suffering from kwashiorkor. From the food aid that WASN got from well-wishers the Nyika Family were able to get some to feed the family. Mai Nyika was also encouraged to join a support group of women living with HIV so that she learns from the support group about all aspects of live. The husband was also encouraged to do piece jobs around the villages so that he would be able to fend for the family. WASN takes care of their medical needs. Women and AIDS Support Network (WASN) is a national activist womenâ€™s group that works to promote the rights of women and girls by providing them with the information they need to protect themselves from HIV and AIDS. WASN was formed in 1989 to respond to the challenges facing women and girls in the area of HIV, AIDS, sexual, reproductive health and rights. For the past 23 years WASN has targeted women and girls in Zimbabwe with information to enable them to enjoy their full sexual, reproductive health and rights. This is achieved through projects which enhance knowledge of sexual health and rights as well as improve access to health services. WASN is engaged in advocacy work regarding womenâ€™s health and human rights. It is recognized in Zimbabwe as the leading gender organisation working with rural women living with HIV and AIDS, offering care and helping women find the means to support themselves and their families. WASN offers training to organizations throughout Zimbabwe on empowering women living with HIV or AIDS and on defeating stigma and discrimination. WASN is also active in advocating for access to treatment in rural areas and training peer educators who raise awareness of HIV and AIDS in their communities.